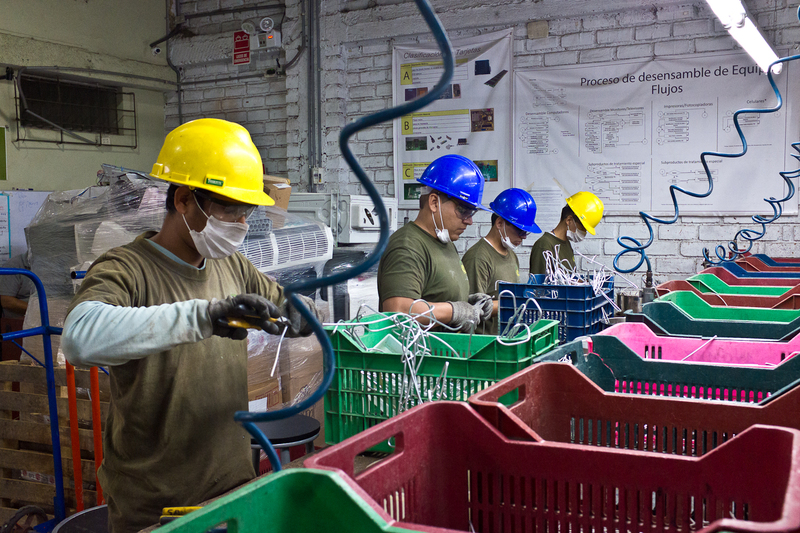 At Peru Green's recycling facility, worker safety is paramount, products are dismantled and sorted at workstations. A small percentage of components are sold to a local metals processor. The majority of components, such as printed circuit boards and copper cables, are sorted and shipped to either the U.S., Europe or China for further processing as Peru Green does not currently have a mechanism to reduce or shred components down to their commodity, or raw material, level. Here, workers use pneumatic tools to dismantle products and wear protective gear. Dismantlers in the informal sector perform the same actions, only with less sophisticated tools. Workers such as these are paid a salary with benefits. Based on interviews with stakeholders, collboration between the informal and formal sectors is currently absent. The rise of the formal electronics recycling sector may threaten the informal sector's access to products and their components for resale, although one recycler noted that there is plenty of material to process in Lima. How can the formal and informal sectors work together so that both sectors of the economy and their relative benefits to society and the environment can thrive?